This article is the second in a series of SOF News articles addressing the Stabilization Assistance Review. It discusses multiple stabilization environments in the context of implementing the Stabilization Assistance Review. At the same time it looks at current Department of Defense (DoD) doctrine which includes a range of military operations which can be overlaid on these environments. In order for the United States Government (USG) to be successful in implementing the Stabilization Assistance Review, Department of State (DOS), the United States Agency for International Development (USAID) and DoD must take a holistic approach that addresses stabilization activities across all stabilization environments and across the full range of military operations. There are three basic “stabilization environments”. These environments are based on the similar “zones” (peace, gray zone, war) that are articulated in a USSOCOM White Paper “The Gray Zone”. 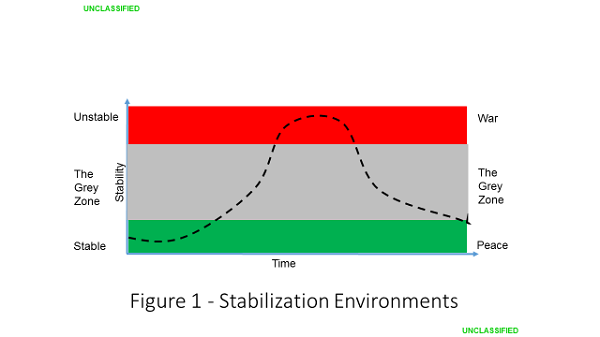 The stabilization environments are: Stable, the Gray Zone, and Unstable environments. These environments are depicted in Figure 1 “Stabilization Environments”. What distinguishes countries in these environments is their capability in the stabilization functions of security, governance, and service delivery, which are drawn from Joint Publication 3-07 “Stability”. Countries in the stable environment demonstrate adequate capabilities across all three functions. Countries in the gray zone environment are usually “fragile” countries who suffer shortfalls in one or more functions; while countries in the unstable environment are usually failed states who suffer significant issues across one or more functions. Over time a country may move through more than one of these environments. As depicted in figure 1 by the black dashed line, a stable country may become unstable or fragile due to one or more issues within the three stabilization functions. If left unchecked, the country may suffer serious issues across these functions and slip into the unstable environment and become a failed state. If corrective actions are taken then it is possible this country may start to re-stabilize and eventually move back towards the stable environment. So what are DoD’s stabilization activities across these environments? Ask most DoD members when stabilization activities occur in the range of military operations and they would say “Phase IV – Stabilize”. This is a sub-optimal response that fails to maximize stabilization activities and their effects. In reality, stabilization activities can be, and are conducted across the full range of military operations. To help explain what DoD’s stabilizations activities are across these environments we can overlay onto the stabilization environments the range of military operations mentioned earlier in this article (Figure 2). 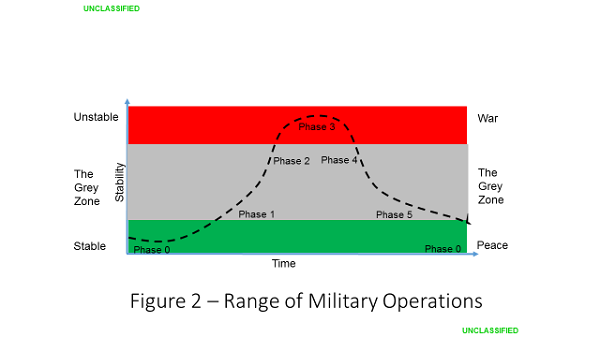 As discussed in Joint Publication 3-0 “Operations”, the range of military operations are; Phase 0 – Shaping, Phase 1 – Deter, Phase 2 – Seize the initiative, Phase 3 – Dominate, Phase 4 – Stabilize, and Phase 5 – Return to civilian control. Countries we assess to be stable are in the green or stable zone in figure 1. In this situation, from a DoD perspective, this is our “shaping” phase of operations and our stabilization activities might only include our normal security cooperation activities as identified in our country plans, and perhaps an occasional instance of foreign humanitarian assistance and disaster relief. However, if a country is fragile it is normally in the gray zone where we would normally be conducting deterrence operations. In addition to the aforementioned Phase 0 stabilization activities, DoD would leverage assets such as Civil Affairs Teams who are deployed out amongst the population, seeing first-hand what the issues are and making recommendations for stabilization activities. Working through the country team, Civil Affairs Teams nominate these activities to insure they support DOS and USAID plans and strategies, and if concurred with, they can implement these activities. Working in close coordination with our USG interagency partners, as well as other international community actors, we could re-stabilize fragile countries. This is similar to the old saying of “an ounce of prevention …”. 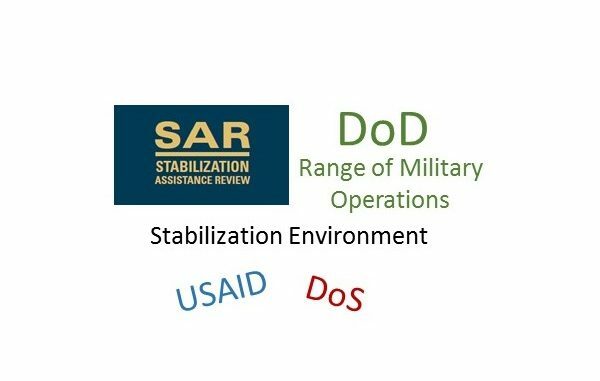 Activities in the Gray Zone Environment and Phase 1 is where the three main USG Organization (DoD, DOS and USAID) can offer the greatest return on our stabilization dollars. Countries that are unstable or failed states are in the red or unstable environment. DoD will likely be called upon to conduct combat operations to initially seize the initiative (Phase 2), then dominate our opponent (Phase 3). 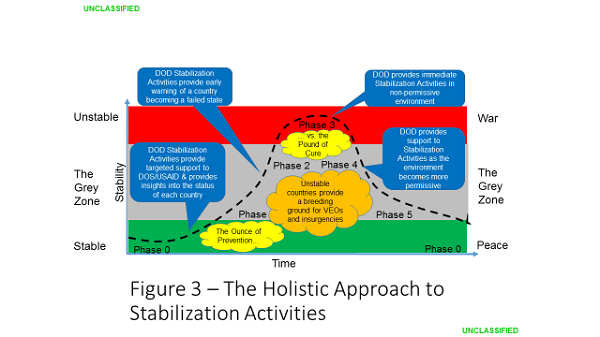 It is important to remember that stabilization activities may occur throughout both of these phases as DoD leverages Civil Affairs capabilities as well as other assets to provide for security, public order, and human needs; and in support of DOS and USAID activities if they are present. As combat operations terminate DoD transitions to Phase 4 and the focus is squarely on stabilizing the country. For countries that have undergone combat operations the scope of stabilization activities in this phase can be significant. This would be “… the pound of cure” that could have been prevented in Phase 1 mentioned earlier. These Phase IV stabilization activities should help drive the country back towards the gray zone environment initially and ultimately back into the stable environment. The Stabilization Assistance Review is largely focused on Phase IV “Stabilize” activities conducted in “conflict affected” countries, rather than stabilization efforts during the earlier phases within the range of military operations. By focusing on conflict affected the Stabilization Assistance Review addresses the greatest stabilization challenge we might face, but it misses our greatest opportunity for success and our ability to achieve our highest return on stabilization investment by taking action sooner. The Stabilization Assistance Review does mention “conflict prevention” but mostly in passing. In order for the USG to be successful in implementing the Stabilization Assistance Review we must take a more holistic approach to stabilization by planning and executing stabilization activities across all of the stabilization environments, and across the full range of military operations as demonstrated in Figure 3 “The Holistic Approach to Stabilization Activities” below. By conducting a comparatively small amount of stabilization activities during Phases 0 and 1 we can keep stable countries stable and help guide fragile countries back to stability. At the same time we are reducing unstable environments where violent extremist organizations and insurgent groups can form and grow. This is in effect the “Ounce of Prevention”. If we focus our efforts in conflict affected countries we are forgoing this opportunity and will pay a far greater price, “the pound of cure”, later in Phase 4. Taking a holistic approach that considers all stabilization environments, and the full range of military operations offers the best chance for the USG to be successful in implementing the Stabilization Assistance Review. Figures: All charts are by the author. Editorial Note: The use of ‘gray zone’ and ‘grey zone’ is common and interchangeable among national security writers. About the Author: Charles Barham is a retired U.S. Army Colonel with 29 years of service (1981-2010). He also served for four years as a Department of the Army Civilian Management and Program Analyst in the Afghanistan/Pakistan Hands Program (2010-2014). He currently serves as a Department of the Air Force Civilian Management and Program Analyst at USCENTCOM in an Interagency Planner capacity. He served for more than three years in Afghanistan as; Assistant Director of the Police Reform Directorate, Combined Security Transition Command – Afghanistan 2006-2007, Senior Socioeconomic Advisor in HQ ISAF-DCOS/STAB under Generals David Petraeus and John Allen 2011, as Deputy Director of the NATO/Afghan Transformation Task Force, HQ ISAF under General Joseph Dunford 2013, and as a Senior Planning, Programing and Budgeting Advisor to the Afghan National Army Special Operations Command. He has served for over six years in HQCENTCOM in positions including Senior Socioeconomic Advisor and Interagency Planner. He has a Bachelor of Science in Business Administration from the University of Richmond, a Master of Business Administration from Oklahoma City University, and a Master of Strategic Studies from the U.S. Army War College.